U2’s return to the concert stage tonight, for the opening show on their ‘iNNOCENCE + eXPERIENCE’ world tour, was nothing short of a triumph. The band delighted the crowd of 19,000 at the Rogers Arena in Vancouver with more than two hours of brilliant musicianship, illuminated by one of the most visually stunning rock productions ever mounted. No fewer than seven tracks from last year’s ‘Songs of Innocence’ album were let loose on an audience for the first time, from the opening ‘The Miracle (Of Joey Ramone)’ onwards. Every one was passionately delivered and warmly received among a compendium of the band’s most celebrated anthems. What gave an explosion of colour to the entire proceedings was the technological masterpiece of a giant construction suspended above the walkway connecting the main and “b” stages. Known thus far within the touring operation as the “divider,” it looks like a fence but serves as a superbly versatile backdrop for animated and filmic visuals, with giant images of the band, moving in real time, projected onto it to give an entirely new dimension. 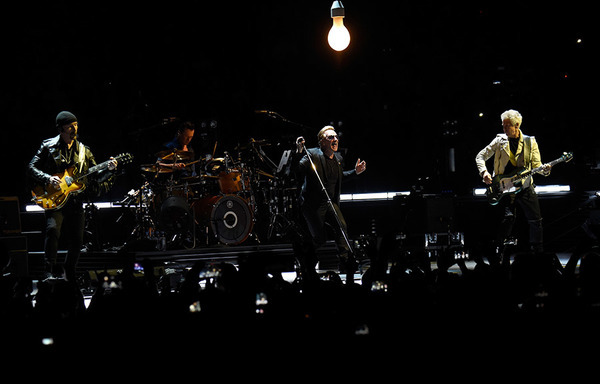 Double-sided, with space for Bono to work his presence in its corridor, the construction filled the entire arena and helped convey a truly surround-sound presence all the way to the back row. 'Technology can be fun,' as the frontman said himself. The main set ended on ‘With Or Without You,’ but there were four more treats in store, with a brightly-lit angular set design for the encore that was launched, appropriately, with ‘City Of Blinding Lights.’ Clearly elated to be back in their element, the band sprinted for home with ‘Beautiful Day,’ ‘Where The Streets Have No Name’ and ‘I Still Haven't Found What I’m Looking For,’ as Vancouver roared its approval. Were you at the show tonight? Add your own review and your photos on our tour page here.